Rakeback is once again available to GR88.com poker players effective this Friday, June 1st. As it was before the program was cancelled by the network last month, GR88 players can once again have up to 35% of their rake refunded. Rake is the commission an online poker room earns on its games. 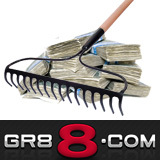 Some poker rooms, like GR88.com, reward regular players by refunding a portion of the rake. Friday also marks the start of the $100,000 'Race to Riches' rake race at GR88.com. This month, four week-long rake races will each award $25K to the players at the top of the leaderboard that week. Race points will be multiplied in ten designated tournaments each day. Race points will be multiplied by 1.1 up to 2 when playing in designated tournaments. GR88.com Poker offers Texas Hold'em, Omaha, Stud and Draw and has a Badbeat Jackpot currently approaching a quarter million dollars. Using a single wallet, GR88.com players can also enjoy hundreds of casino games from Microgaming and CTXM or bet on thousands of sporting events including in-game betting.